When Professor Robert McDonald was teaching an advanced derivatives class in 1994, he was struck by the paucity of texts on the subject appropriate for gifted MBA students. Though there were books about derivatives — the financial contracts whose values stem from stocks or bonds, commodities or market indexes — some were too mathematical, and others not analytical enough. In response, McDonald, the Erwin P. Nemmers Distinguished Professor of Finance, began writing the text he was looking for. 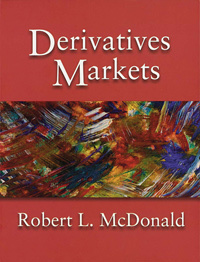 The resulting work, Derivatives Markets, published last summer, takes a methodical, sophisticated approach. Derivatives are so critical to finance, McDonald says, it’s difficult to talk about investment decisions and whether firms should issue debt or equity without an understanding of them. Derivatives are even critical to everyday life: “You can’t even be a homeowner anymore without understanding derivatives,” he points out. For example, a homeowner who needs to heat her house might opt to pay per unit of gas used, with the price fluctuating, or may choose to pay a fixed dollar amount each month regardless of the amount consumed. The plans are simply forward contracts, or contracts that specify the price and quantity of an asset to be purchased in the future. “If you don’t understand derivatives, you can’t really understand where the prices come from,” McDonald says. MBA students should understand the advantages and disadvantages of the types of derivatives included in the book, he says. Call options, one of the derivatives discussed, give the holder the right to purchase a certain number of shares of stock or other assets at a given price on or before the contract’s expiration date. Put options provide a security that lets investors sell a fixed number of shares at a fixed price within a given period. Forward contracts specify the price and quantity of an asset to be delivered in the future. The book also includes chapters on risk management, commodity forwards and futures (similar to forwards), exotic options and financial engineering. Through all the chapters, McDonald infuses the book with an enthusiasm for the subject, apparent in the energetic clip of his writing and the real-life examples he employs. When equations are used, they elucidate material already explained. The Black-Scholes Formula also is covered. It’s a model for pricing equity options that has inputs of the stock price, the exercise price of the option, the risk-free interest rate that prevails, the time that the option has to expiration and the expected volatility of the stock return. To McDonald, the model is important because it made Wall Street more scientific. “What Black and Scholes really did is to provide a coherent, novel way to think about how to price an option. It revolutionized finance, there’s no question about it,” he says. Still, McDonald says it was critical for him to write the book, not only because of the importance of the subject, but because the material formed such an integral part of his teaching. One of his favorite things about being a professor, he says, is sharing these insights and his academic passion with others.